Eyvind Earle, “Three Noble Horses,” 1993, oil. 60″ x 60″. 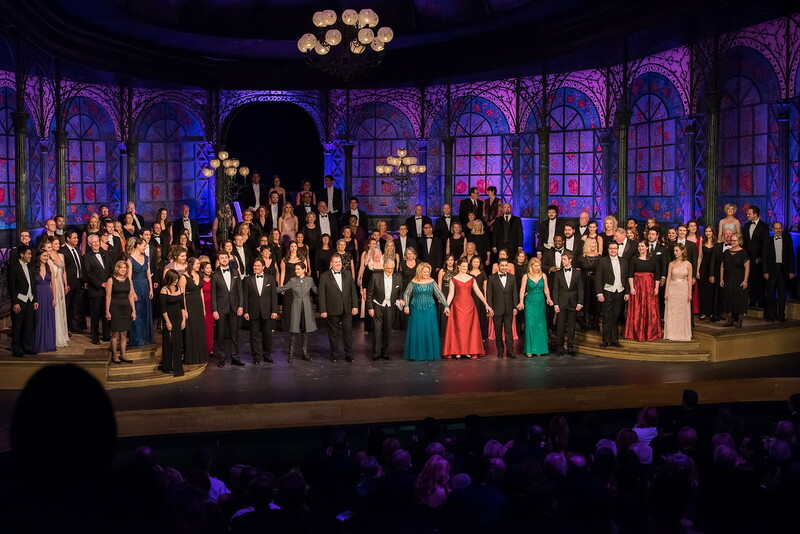 Gift of the Earle Family Trust to the Hilbert Museum. 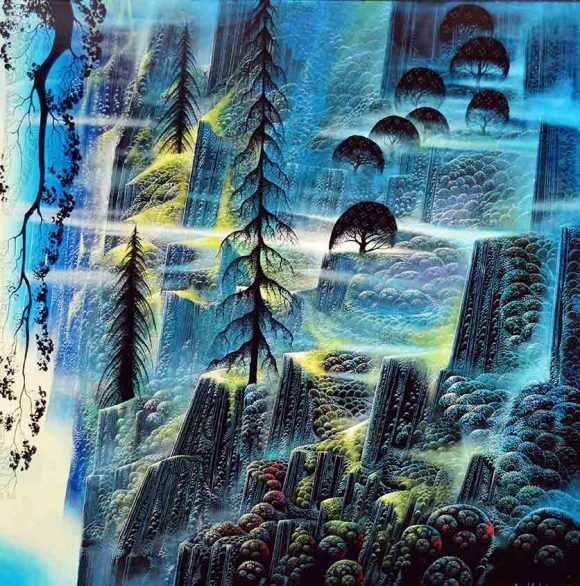 Eyvind Earle (1916-2000) – artist, illustrator, author, poet and recipient of the prestigious Disney Legend award — is probably best known to the general public as the man responsible for the styling, color and backgrounds of Walt Disney’s Sleeping Beauty (1959), giving that beloved classic its sumptuous and dazzling medieval look. But Earle was also a brilliant and unique fine artist, whose colorful landscapes, portraits, black-and-white prints, drawings and Christmas card designs – as well as examples of his Disney work — are currently on display at the Hilbert Museum of California Art at Chapman University in the exhibition “Magical Visions: The Enchanted Worlds of Eyvind Earle,” through October 13, 2018. 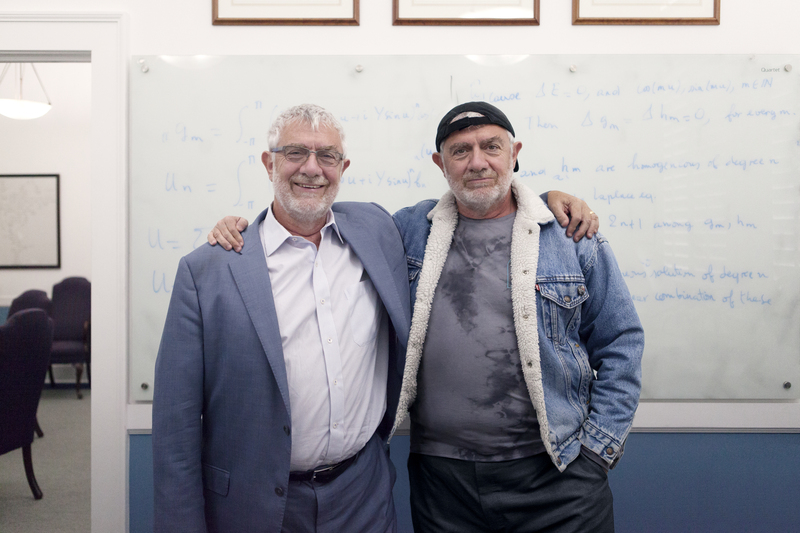 In connection with the exhibition, the Hilbert Museum has received a generous donation of eight major paintings by Earle, gifted by the Earle Family Trust. These works are currently on display to the public in the “Magical Visions” exhibition, and will be placed in the museum’s permanent collection. The exhibition, curated by Ioan Szasz, CEO of Eyvind Earle Publishing, also includes other works from the Hilbert permanent collection and on loan to the Hilbert Museum from the Earle Family Trust. Eyvind Earle’s ambitious designs and intense dedication to detail on each of Sleeping Beauty’s backgrounds continue to be the main forces behind the movie’s classification as one of the most artistically distinct Disney films to date. His inventive concept art also helped shape such enduring mid-1950s Disney favorites as Peter Pan (1953) and Lady and the Tramp (1955). Born in Manhattan in 1916, Earle moved to California with his family at the age of two. By age 10, he was taking art classes, and he had his first solo show in France at age 14. Earle always set challenging goals for himself, and more often than not, he met them. At the age of 21, he set off alone on a cross-country bicycle trip from Los Angeles to New York, earning his meals along the way by painting watercolors. A few years later, already recognized by the East Coast art establishment, he was showing his works at the Charles Morgan Galleries in New York City. The Metropolitan Museum of Art purchased one of his paintings for its permanent collection. His work at Disney Studios, starting in 1951, encompassed short animated films as well as the feature-length classics. Earle caught Walt Disney’s eye in 1953 with his designs for a short called Whistle, Toot, Plunk and Boom, which won the Oscar for Best Animated Short that year. He went on to design and paint the settings for such Disney shorts as Pigs is Pigs, Paul Bunyan and For Whom the Bulls Toil. For his groundbreaking work in animation arts, Earle received the International Animated Film Society’s Winsor McKay Award in 1998. 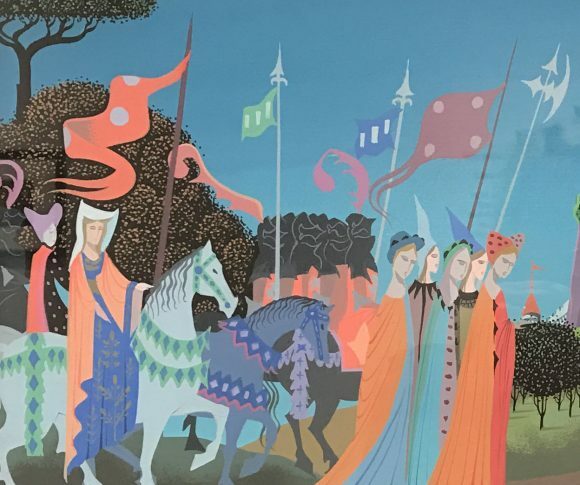 Eyvind Earle, Concept art (detail) for Walt Disney Studios’ “Sleeping Beauty,” c. 1958, gouache on board. The Hilbert Collection. Outside of his Disney work, Earle was a prolific painter of landscapes and figurative works. His “Three Noble Horses” — part of the Earle Trust’s gift to the Hilbert Museum — is an outstanding example of his later pieces. 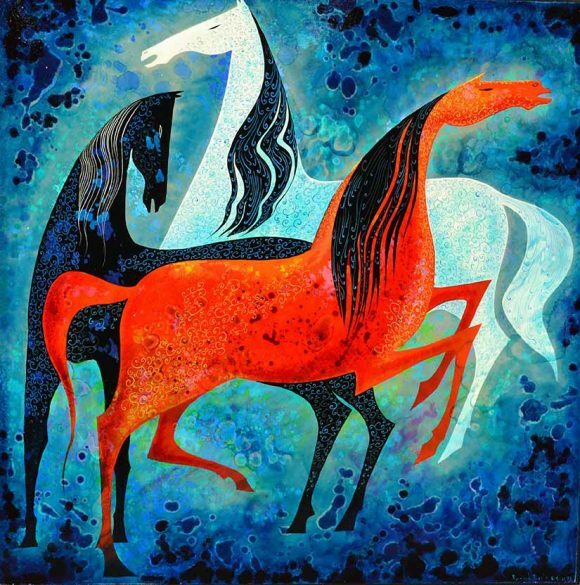 The large square work (60 x 60 inches) showcases three stylized horses in shades of white, blue and red. The horses are similar in style to those of traditional Navajo artists – a style that influenced Earle when he briefly lived and painted in the American Southwest. Eyvind Earle, “Where Eagles Fly,” 1993, oil. 48″ x 48″. Gift of the Earle Family Trust to the Hilbert Museum. The other seven paintings in the Earle Trust’s gift to the museum are mostly large-scale landscapes. Earle’s portrayals of natural landscapes, atmosphere, color and lighting convey landmass and mood, and the magical, awe-inspiring spirit of the elements. The current exhibition celebrates Earle as one of the most innovative landscape masters of his time – inspiring a new generation of artists working today. Earle also branched out into a lucrative side business, creating more than 800 original designs for Christmas cards. To date, his cards have sold more than 300 million copies; the Hilbert Museum is displaying some of his original Christmas card paintings in the current exhibition, alongside examples of the cards themselves. 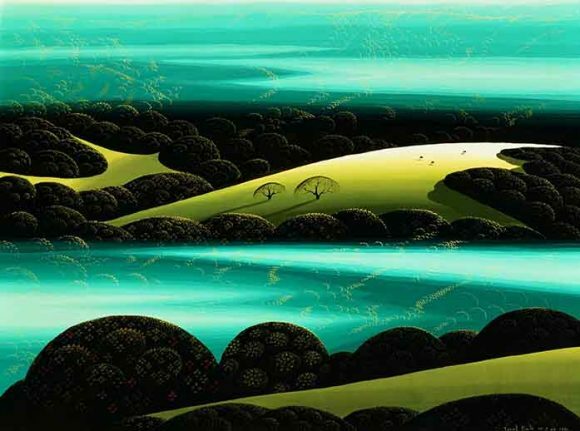 Eyvind Earle, “Emerald Dawn,” 1992, oil. 30″ x 40″. Gift of the Earle Family Trust to the Hilbert Museum. In 2015, the Walt Disney Company posthumously awarded Earle the Disney Legend Award ® for his work on “Sleeping Beauty” and his invaluable contributions to the art of animation. Kristen Earle Thompson, the daughter of Eyvind Earle, received the award on behalf of her father. Other exhibitions at the Hilbert Museum through October 13, 2018 are “Scenic View Ahead: The Westways Cover Art Collection,” in cooperation with the Automobile Club of Southern California; “Sunlight and Shadow: A Gift of California Art from the Collection of Jim and Lynne Doti;” “A New Hope: The Star Wars Art of Robert Bailey.” Continuing are: “American Illustration: Children at Play” and “Character References: The Art of the Animation Drawing,” as well as works on display from the permanent collection. The Hilbert Museum is located at 167 N. Atchison St. in Orange, across from Ruby’s and the Orange train station. Hours are Tuesday-Saturday, 11 a.m. to 5 p.m., and admission is always free. There is free public parking in front of the museum (with a permit obtained inside), and the Chapman community and the public may also park in the Chapman University West Campus structure at 230 N. Cypress St. (public parking on top floor only), located about one block north of the museum.